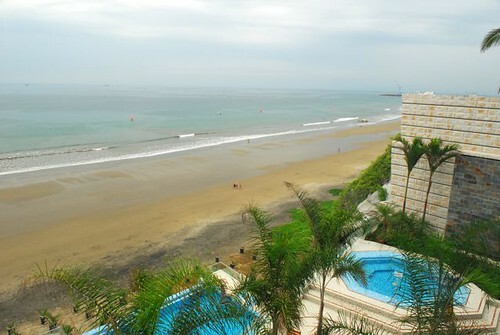 One way to beat the recession is to live in Ecuador and enjoy its low cost of living. 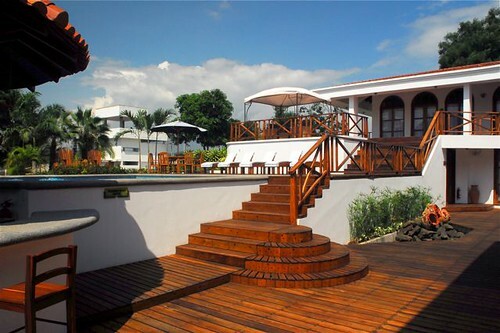 How can one earn extra income while in Ecuador? In a moment we’ll look at why internet businesses in Ecuador are now easier. First, why have your own internet business at all? Yesterday’s message about Ecuador & Longevity showed how your own business can help you live longer and better… when you have a business that you love. That in itself is a pretty good reason to be your own boss with an internet business. There is a good chance that this recession will manifest itself in the form of currency destruction..rather than growing unemployment. Governments are spending trillions of dollars (that they do not have), to kick start the global economy back to life and to create jobs. This gets the job market rolling again but that money people will earn is likely to lose value. Printing money to create jobs without real production creates inflation. Inflation destroys the purchasing power of cash. This means that the best four ways to beat the recession is to invest in real estate… commodities or shares (these are all investments that will rise with inflation) or … to invest in your own business. A Time Magazine article entitled “The New Internet Start-Up Boom: Get Rich Slow” by Josh Quittner helps explain why. Here are excerpts from that article (see a link to the entire article at the end of this message). At no other time in recent history has it been easier or cheaper to start a new kind of company. Possibly a very profitable company. Let’s call these start-ups LILOs, for “a little in, a lot out.” These are Web-based businesses that cost almost nothing to get off the ground yet can turn into great moneymakers (if you work hard and are patient, but we’ll get to that part of the story). How do you get started? All that’s required is a great idea for a product that will fill a need in the 21st century. These days you’d do best if your idea either makes people money or saves them money. That’s what John Tayman is doing. 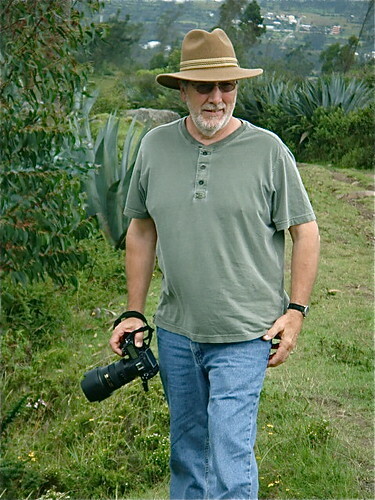 He’s an author (The Colony, about a former leper colony near Maui) who lives in San Francisco, where I met him; he wrote reviews for a business magazine I edited. Tayman knew little about technology and even less about business. Tayman said he intended to build the site on the side while continuing to write for a living. He’d work on his new company only at night and on weekends. Oh, yes, and he had only about $10,000. “Good luck with that!” I thought. Ideas are much easier to hatch than they are to execute. Tayman went to work with nothing more than his PowerBook laptop. A hyperorganized fellow, he quickly discovered a trove of freebies online — instructional manuals and sites aimed at bootstrappers — that walk you through the process from start to finish. Within months, Tayman had a virtual staff of 20 employees working for him in five different countries. “In fact, I didn’t even meet the guy who built most of the site until the launch party,” he says. The article goes on to say that Tayman worked on the site about 10 hours a week and did not spend a cent on marketing or advertising. The site’s growth is modest but steady: nearly 10,000 people visit each week. It is easy and inexpensive to start an internet business. Now it is even easier to start an Ecuador internet business because mobile internet is now available in Ecuador. Three cell phone operators are now offering an internet connection via a USB connecting modem that receives a data signal via their cell phone networks use. This modem allows you to hook up to the internet anywhere in Ecuador where there is a cell phone signal. 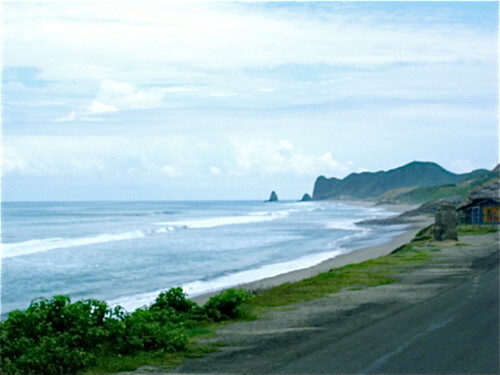 This means that anywhere in Ecuador where there is even a hint of civilization you can have broadband! We offer a special service using Porta Cell Modems, the Ecuadorian subsidiary of Carlos Slim’s America Movil conglomerate. In a country with a 13 million population there are surprisingly 9.7 million cellphone users (2007) and Porta has 68% of the market. Porta´s mobile internet service is called ‘Internet Banda Ancha Movil de PORTA’. They are rapidly rolling out the latest 3G technology that allows for faster speeds. The 3G speed is advertised as up to 1.2 MBs. 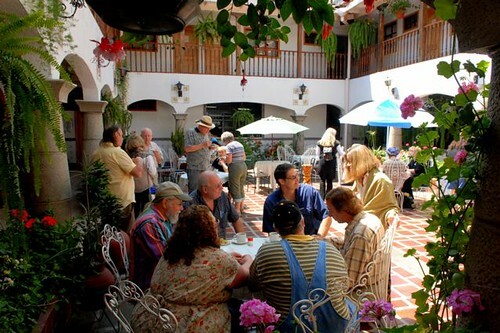 I have used this service and it allows me to work on broadband almost anywhere, in a cab, sitting in a cafe… like our courtyard at Meson de las Flores. Here is a group in the courtyard on one of our tours. I can work from the park in Cotacachi’s central plaza. 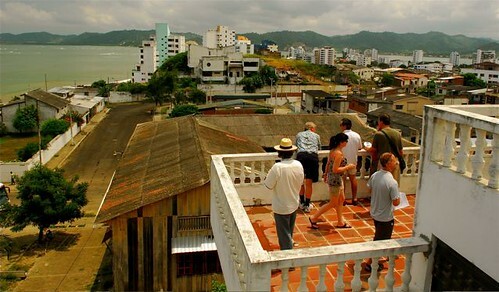 can work the beach… almost anywhere… such as here in Bahia where we had a group on a real estate tour. 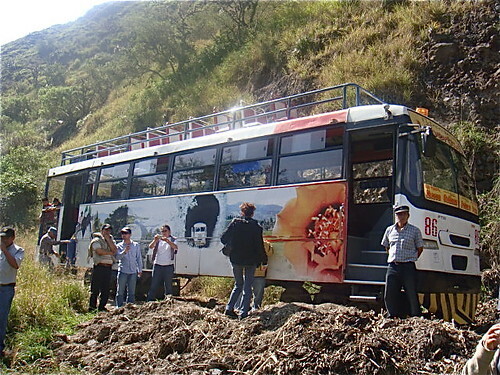 I can work on an Ecuador bus… and have. or even on the train there. 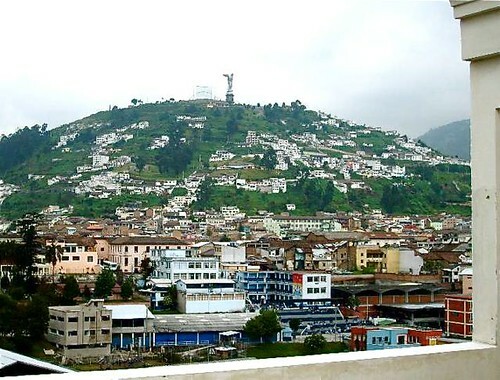 I can work in busy cities like Quito. I can work as I travel and there´s no more worrying about finding a hotel with wireless service (and hoping it works). The service is less than $80 a month. The only downside is that an 18 month contract is required. We have resolved this by buying the modems so our subscribers can use them on a month to month basis without the long term contract. We add $10 a month for this and charge $90 for a month. We are in the worst economic correction since the 1930s. This creates enormous opportunity and now low cost countries like Ecuador are becoming better, with wonderful people and cheap cost combined with the the convenience of broadband. Learn about our internet course “Tangled Web – How to Have an Internet Business” here. A number of readers have sent questions about Ecuador economic worries. One regular Ecuador economic worry I receive is that Ecuador will stop using the US dollar as its currency. 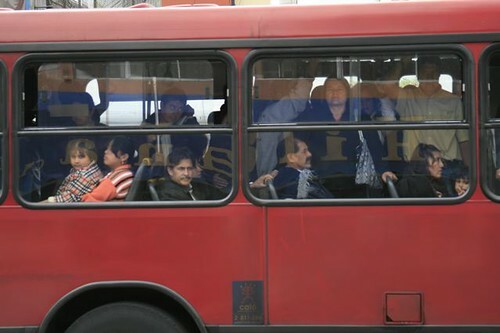 There is little doubt that Ecuador’s economy is in a mess. 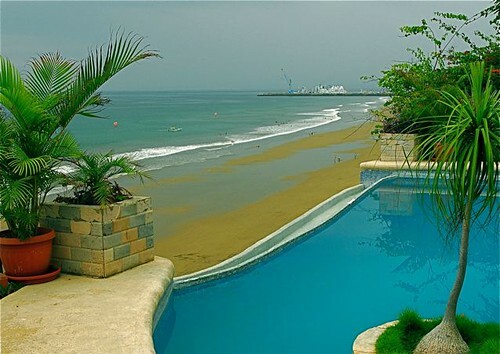 We’ll look at this Ecuador economic worry in a moment, but to put this worry into perspective, may I share some other economic worries at the same time… plus post some photos from our friend, Dennis Goff… such as this shot from a boutique hotel in Manta, Ecuador where you can stay for $52 a night. These pictures were taken by our friend Dennis Goff and they make an important point. 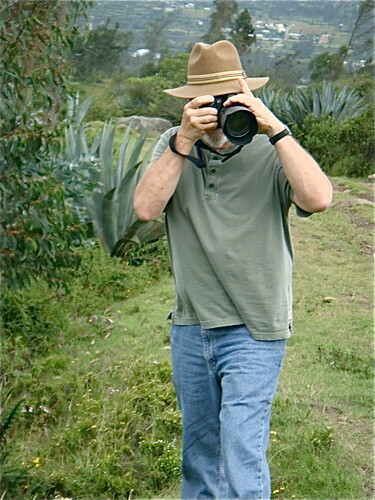 Dennis is a friend and a professional photographer. He and his wife, Nicki, live part time in Ecuador and often join us on our tours where he helps us by providing some really great shots. Ecuador has economic worries, yes, but are they worse than the economic worries in Europe or the US? 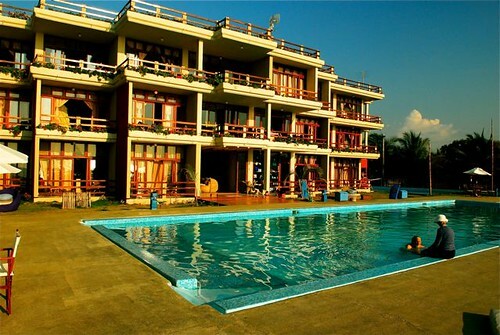 The photos show that while we worry we can be in paradise on a shoestring budget. For example, Dennis took this shot of a four floor Bahia, Ecuador house on our latest Ecuador coastal real estate tour… just $95,000 asking. views. Here are our real estate tour delegates viewing this house. I wonder if the Western economic and social system will do well if the current economic downturn continues? Global economic problems are not likely to disappear soon and they are everywhere! WASHINGTON — The Congressional Budget Office placed a new hurdle in front of President Obama’s agenda on Friday, calculating that the White House’s tax and spending plans would create deficits totaling $2.3 trillion more than the president’s budget projected for the next decade. Senator Kent Conrad said the budget office analysis confirmed the need for adjustments. The difference largely reflects the administration’s more optimistic forecasts of economic growth through 2019. The budget office figures, which will guide Congress as it takes up Mr. Obama’s proposals in earnest next week, were worse than Democratic leaders expected and further complicated their job of achieving the president’s priorities on health care, energy policy and much more. Moderate Democrats from competitive districts and states have already expressed nervousness about some of Mr. Obama’s plans, especially as Republicans have grown increasingly emboldened to stay on the attack. Senator Judd Gregg of New Hampshire, the senior Republican on the Senate Budget Committee, said the new report “confirms that under the president’s plan, our debt will increase to shocking levels that are simply unsustainable and will devastate future economic opportunities for our children and grandchildren. I fear that anyone looking for a perfect place, with honest, intelligent politicians, a great economy, perfect law and order and a low cost of living will have a long search. 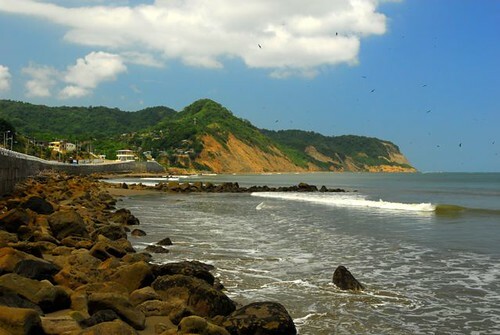 At least while searching for economic stability in Ecuador, you can enjoy perfect weather, friendly people and incredible values. Ecuador’s economy is oil dependent which creates economic problems if oil prices remain low. 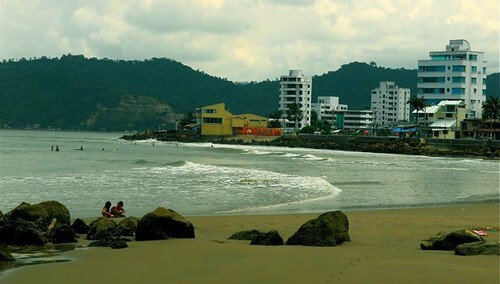 Yet Ecuador has many other resources and for gringos it offers amazing value. membership in this club house… with spa, pool, luxury dining and tennis on the beach? Lower oil prices have reduced Ecuador revenues. Remittances from Ecuador workers abroad have dropped and foreign investments have fallen due to the rising dollar and Ecuador’s decision to default on its bonds. Because the U.S. dollar is Ecuador’s currency, it doesn’t print its own money. This keeps politicians who would like to turn on the printing machine from doing so. This is why Ecuador dollarized in the first place. Dollarization worked an economic wonder. Inflation fell from over 70% to below 5% in 2001. But extra income from oil set the government on the wrong course… just as the high 1998 tax revenues in the US set America’s government on a spending spree at exactly the wrong time. Now a severe trade deficit caused by the strong dollar is draining Ecuador of dollars. The dollar has risen versus currencies in Colombia, Brazil, Argentina, etc. This makes goods in Ecuador cost more and thus they are harder to export. Ecuador’s government has reacted by creating high import taxes to slow down imports. This has caused the cost of living to rise in Ecuador. March 19 (Bloomberg) — Ecuador’s banking system strains and plunging foreign-exchange reserves may force the South American country to drop the dollar as its currency, Credit Suisse Group AG said. “Mounting pressures on the banking system could potentially harm the fiscal accounts further and could force the government to de-dollarize the economy, in spite of its wish to continue to defend the use of the dollar as the country’s currency,” Diego Sasson, a Credit Suisse analyst in New York, wrote in a report published yesterday. “Ecuador won’t abandon use of the dollar to offset plunging oil revenue and worker remittances from abroad,” President Rafael Correa said today in an interview with the Unimax television network. The country adopted the dollar in 2000 to help curb inflation after the sucre tumbled 73 percent against the dollar and the government defaulted on $6.5 billion of foreign debt. Ecuador’s use of the dollar gives Correa no outlet for providing credit to the economy as access to foreign financing dries up and revenue from oil sales slides. Crude, which has dropped 65 percent from a July record, accounts for 60 percent of Ecuador’s exports. The country’s foreign reserves declined 5 percent to $3.31 billion in the week ended March 13, the lowest since June 2007, the country’s central bank said in a report on its Web site March 16. Reserves have plunged 47 percent from $6.5 billion in September as the global recession eroded demand for oil exports and the country defaulted for the second time this decade. delegates at our recent coastal tour paid. The Ecuador economic worry is that dropping the US dollar could cause an economic collapse that would somehow destabilize the country. But those who are concerned about Ecuador economics may not have thought the problem and resultant social economic reactions all the way through. Perhaps they have not lived and invested abroad for 41 years as Merri and I have. 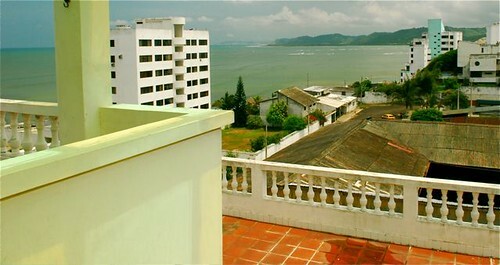 this one bedroom condo ($75,000 asking) in Manta. I started my business career in Hong Kong when bombs were being set off by terrorists. I saw how the fear created by those bombs built fortunes for those who did not over react. If Ecuador eliminates the dollar as its currency, chances are that the cost of living in Ecuador for those who earn dollars… such as those living on social security and or pensions, will drop. In other words, if Ecuador returns to the sucre life gets better for the gringos whose income is generated from abroad. 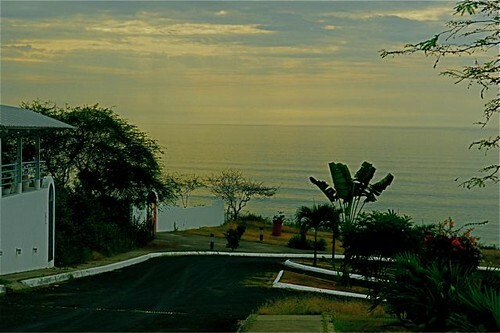 Delegates on our most recent Ecuador coastal real estate tour bought lots in this gated community for $17,500. This is assuming that a collapse does not create too much social unrest. Fortunately we have some recent Ecuador economic history upon which to reflect. In 1999 Ecuador’s economy came to a grinding halt. All the banks shut. Ecuador ran out of gas. Millions emigrated to Spain, Italy and the US. Were there riots? No. Murders? No. Mayhem? No. Social disintegration? No. A breakdown of law and order? No. My reaction to that 1999 crisis. I bought 962 acres of Ecuador real estate. 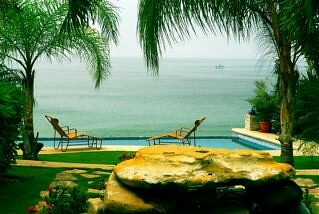 Ecuador is a pretty good place to be in times of economic collapse. three bedroom units at $130,000 asking. There is always plenty of food. 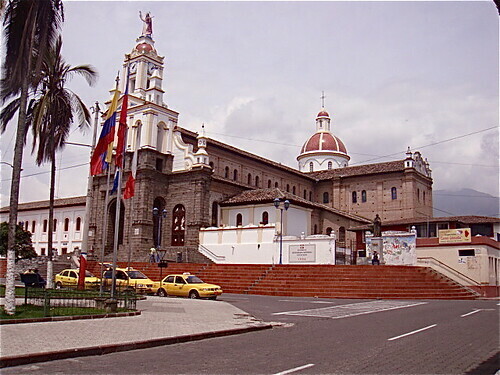 Ecuador’s people are happy, friendly and industrious. They have never learned to expect much from their government. They have never learned to rely much on the purchasing power of paper money or Ecuador’s banks. We are living in a time of global change and turmoil. My belief is that those who ignore or try to avoid this fact will have a hard time. Those who embrace change and adapt will have greater than average opportunity. See more on this thinking at Ecuador Perceptions and International Investments in Fear. 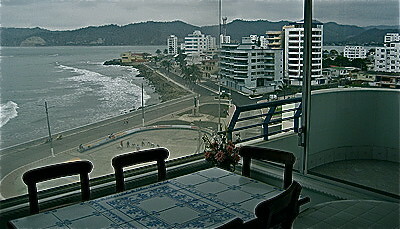 Here is another shot of the Manta condo that Dennis took on our last Ecuador coastal real estate tour. #1: Markets are efficient in the long run but financial markets are not effective short term due to human behavior. #2: To attain higher growth you must either increase risk or trust luck. #3: Invest in inexpensive equities or real estate that is paying a reasonable dividend or rent. The economic cleansing we are enduring has not changed any of the rules above but has made it easier to find good inexpensive shares and real estate. the asking price is only $81,000. #1: Do not care too much about day to day volatility. #2: Care more about strategy. #3: Avoid short term buying and selling. Spend time analyzing and forecasting instead. The condo above is near this shot. Here are rules for gaining in a market crisis. #1: Turn on the auto pilot and normally add to your position. #3: Do not let feelings influence you too much. #4: Do not count on extraordinary returns. Be realistic. #6: Know that a period of low returns will be followed by a period of high returns. #7: Do not underexpose yourself for the long term. Here is another scene near the Bahia condo. Ecuador may or may not leave the US dollar behind. If it does, I expect real estate values to move just as they did before Ecuador dollarized. Hotel rooms were quoted in dollars and changed daily as the sucre fell. 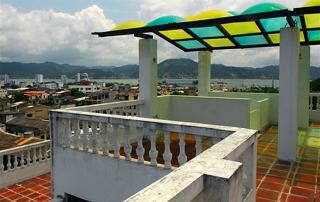 Real estate was bought and sold in sucre but the price changed each day as the sucre fell. 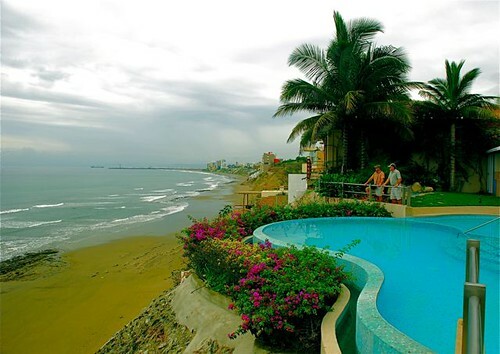 Ecuador real estate is a global commodity just like oil. The price will adjust to a falling currency… which is why Ecuadorians always invest in real estate instead of bonds, shares or bank accounts. We can choose to worry or not….about Ecuador’s economics… or those in the US, Europe or anywhere. We live in a global economy. We can also choose where to be when we worry. Ecuador offers many reasons why it’s a good place to be during these times of change. Until next message, may all your changes be good. See details about each of our seminar and tours below… then see our December special that allows you to attend as many of these courses you like at a huge savings. For International Investing and Business. You gain discounts by attending multiple seminars and tours. But our 2009 International Club membership which allows you and a guest to attend as many of the 56 courses and tours we’ll sponsor and conduct in 2010 (fees would be $40,947 for all these courses individually) is only $2,999. The International club fee rises to $3,500 in January 2010. Enroll in the International Club now at the original fee of $2,999. Save $501. Attend our 56 investment, business, Spanish, real estate and export, courses and tours in 2010 with one small enrollment fee. Here are the 56 courses and tours you can attend free. Plus there is even one more savings you will see below. Join us in February or March. Feb. 11-14 Quantum Wealth Florida -International Investing & Internet Business, Mt. Dora, Fl. 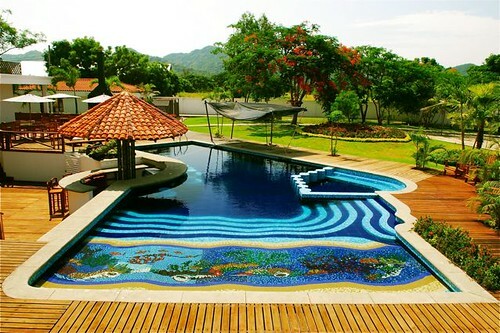 If you join the International Club, the entrance fee for 2010 is $2,999 (until January 2010). Your attendance fees at all courses will be waived. You and your guest can attend courses worth $40,947. You can calculate the savings as our schedule of all 2010 courses is shown below. Arrival dates are always one or two days earlier. Please double check with us before booking flights. I invite you to be a member of the International Club which allows you and your guest of your choice to attend all of these courses which are valued at $40,947! You may well wonder why I would make such an offer and ask why the cost is so low? Let me answer this question frankly and from the heart. First, it helps us do a better job for you. We feel greatly enriched when we can really help our clients improve their lives. We have learned through years of experience the best way to do this is to meet with you regularly. We can best help you learn how to improve your health and wealth through continual expansion of knowledge. Second, we gain enormous fulfillment from the many friendships we form through the years. Our friends have enriched our lives tremendously. Let me explain this in more detail. As a member, you will be part of our international family that meets intensively over the next year to examine ways we can make our lives better. Our goal is beyond just having money. Our goal is to have quantum wealth… good health… wealth and fulfillment through service. Though I give all course delegates my very best, I cannot help but to do a better job for those who come again and again. As we meet often; your particular wants, needs and desires become clear, and it is easier for me to point you in the right direction. Another phenomenon is that repeat delegates help each other! They get to know one another, help each other learn, share their insights, make contacts and gain more wealth. Out associates in Ecuador, are experienced business people who live or work and conduct our real estate and export courses. They can also act as your local backup for the business. Lifestyle for Two. There is more! I have learned at my courses that many repeat delegates were couples. Won’t you join us in this exciting club and share Merri’s and my lifestyle for the next year? We look forward to seeing you at as many courses as possible and sharing this wonderful world of abundance and well being with you!